In keeping with the Thanksgiving holiday spirit, today's post features our favorite illustrated friends gathering around their table. Also on exhibition (besides their enviable place settings) are at least three different light sources. Happy Thanksgiving! "Balanced lighting isn't necessarily brilliant lighting. 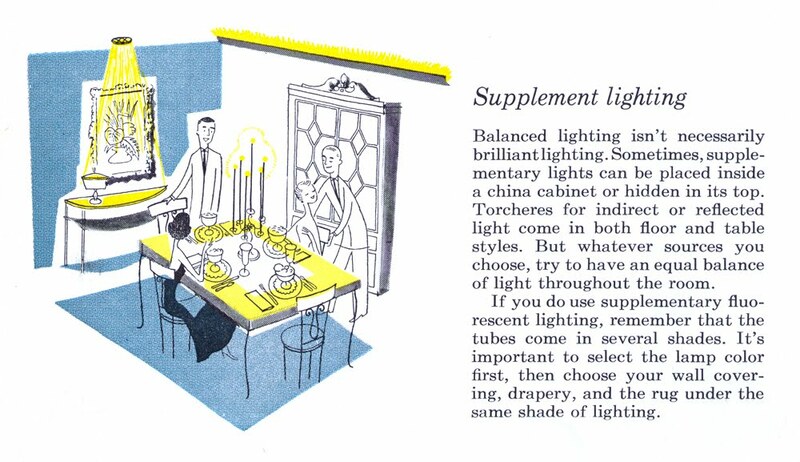 Sometimes, supplementary lights can be placed inside a china cabinet or hidden in its top. Torcheres for indirect or reflected light come in both floor and table styles. But whatever sources you choose, try to have an equal balance of light throughout the room. If you do use supplementary fluorescent lighting, remember that the tubes come in several shades. It's important to select the lamp color first, then choose your wall covering, drapery, and the rug under the same shade of lighting."